As the name suggests, there’s a lot to like about Pleasanton. Located thirty miles southeast of Oakland, the upscale enclave is a perennial contender in “best” or “wealthiest” city competitions, and on a Saturday morning in February it’s easy to see why. The sun is shining, a nearby farmers’ market is bustling and tan people on bicycles worth more than many used cars are zooming past. Which makes the scene at one end of the quaint downtown—where a line of a dozen cops keep close watch on a boisterous crowd of union activists and Occupy Oakland members—all the more incongruous. Despite twice-daily pickets, an NLRB complaint against the club for unfair labor practices and the disruption of a large tournament last summer, Castlewood’s management has been unwilling to budge. So in January workers took their campaign to Occupy Oakland. After detailing a fight that seemed tailor-made for the movement—the wealthy versus the workers, amid a backdrop of palm trees and golf tees—Occupy voted unanimously to support the campaign. In Pleasanton, that support has added a noticeable jolt of energy and visibility to the fight, where at least 100 Occupy Oakland members have turned out, complete with a nine-person band and a satirical “Save the 1%” rally, with people dressed in suits carrying signs like Golfing Is a Human Right. “Instead of looking above for solutions, we look to the people next to us,” Barucha Peller, an Occupy activist, tells the workers. “Therefore, the fight of Castlewood workers is also our fight, and gives us strength. All right, let’s shut it down!” When the large march reaches the country club, the deed has already been done: fearing disruption, the club has closed its doors for the day. 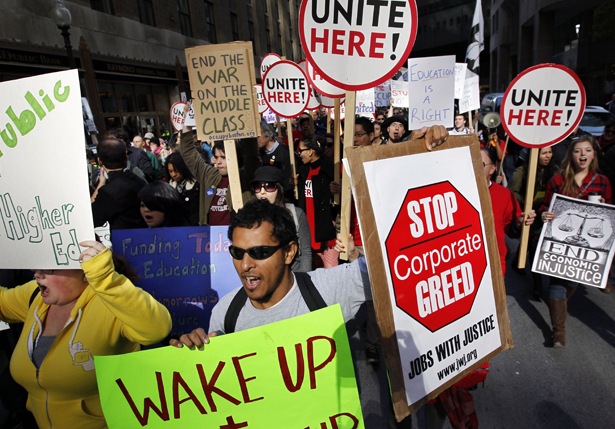 It was enough to make a person believe one of the signs I noticed on the march: Labor + Occupy = Working Class Victory. Nothing, of course, is so simple—especially not in Oakland, where two port shutdowns have led to increasingly strained relations between Occupy Oakland and the International Longshore and Warehouse Union. Both shutdowns—on November 2 and December 12—were called by Occupy in solidarity with the ILWU’s fight against grain terminal operator EGT in Longview, Washington. The conflict began last year, when EGT brought in another union to work its $200 million terminal. This threatened the jurisdiction in the grain industry of the ILWU, whose master agreement covers 4,000 workers in the Pacific Northwest. If one company could defy the ILWU and chip away at the hard-won standards guaranteed by the agreement, others would almost certainly follow suit. That the first major conflict between Occupy and organized labor would break out between the ILWU and Occupy Oakland is ironic in light of the union’s proven willingness to engage in bold, sometimes extralegal direct actions, which would seem to fit right into Occupy’s philosophy. In Longview, for example, ILWU members blocked trains with their bodies, dumped millions of dollars’ worth of grain and even tore down fencing and occupied the terminal. In New York, longtime union activists like Pollack and DiSalvo serve as a key bridge: they are critical of unions for their hierarchy and lack of radicalism but also believe organized labor is a key institutional partner in any fight for the 99 percent. Young people struggling with poor job prospects or precarious employment haven’t found the union movement relevant for a long time and aren’t likely to be won over by someone like Richard Trumka. Seasoned unionists who don’t always toe the union line—and who were with OWS from the beginning—make much better messengers. The OWS labor outreach committee, which meets in the union office of DC 37, fields more than half a dozen requests each week from unions looking for support. According to DiSalvo, the group has actually grown more active since the eviction, despite media claims to the contrary. (“The mainstream media don’t seem to know we exist unless the cops beat us up,” she quips.) Especially exciting for DiSalvo has been the ability of OWS to bring various unions together. During the ongoing Teamster campaign against Sotheby’s auction house on Manhattan’s Upper East Side, OWS mobilized some 200 people from ten different locals for a raucous picket. “Different unions have supported us more than they’ve supported each other,” she marvels. Labor’s debt to Occupy—beyond its helping with turnout and engaging in creative civil disobedience—can best be measured by the dramatic change in the national conversation. Labor had its charts about CEO-to-worker pay and the correlation between the drop in organized workers—today standing at a measly 11.9 percent—and the rise of inequality. But they tended to put people to sleep. While powerful unions like SEIU (my previous employer) were dropping millions of dollars trying to come up with an answer to the poisonous atmosphere created by the Tea Party, a small group of scruffy radicals moved in and showed the way. “All of a sudden, in the last month or two, unions are winning contracts,” says DiSalvo. In Philadelphia several contract negotiations ended on good terms after Occupy Philly set up tents. In New York the 22,000 office cleaners of SEIU-32BJ also inked a new contract on favorable terms. Although it’s impossible to ascertain the extent of Occupy’s influence on such specific outcomes, unions readily admit that the new environment has shifted the terms of the debate in their favor. The powerful are now forced to adopt Occupy’s vocabulary, doing their best to react to a changed landscape in which they are suddenly on the defensive. A spokesperson for Pleasanton’s Castlewood Country Club told me that the majority of the club’s members are not part of the 1 percent. There’s good reason to doubt the claim—but it’s worth noting that he chose that phrase. I had asked him about something else. Back on the West Coast, there have been more developments recently in the ILWU’s situation that have added a new dimension to its relationship with Occupy. After learning that a grain ship was likely heading to EGT’s Longview facility, ILWU president McEllrath issued a call for members to prepare to mobilize. Not long after, despite less than encouraging words from much of the ILWU’s leadership, Occupy groups in Oakland, Portland and Longview pledged to physically prevent the ship’s loading, and prepared to send caravans to Longview. (OWS sent $25,000 to help pay for the buses and other expenses.) In response to the threats, the Coast Guard announced it would establish a “safety zone” and usher the ship in under armed watch. There is a tendency on the left to lecture Occupy. Sometimes such lectures are justified: breaking into City Hall and burning an American flag, as occurred in Oakland, may be honoring a “diversity of tactics,” but if the tactic shrinks instead of builds a movement, it’s best discarded. Mostly, though, the professorial stance that some bring to Occupy seems based on the desire to clean up the messiness inherent in a bunch of people with different views getting together and talking so much about so many things. But that’s not likely to change; and if it did, it would probably mean that Occupy had gotten too small to do anything of real impact. Campaigns can be targeted and relentlessly on message; social movements of the Occupy variety are far messier. But behind that messiness is energy, something that most unions need a lot more of in their campaigns. Still, there are plenty of promising signs for the future. The next big challenge and opportunity is May Day. In New York, heeding calls for a general strike that originated with Occupy LA, OWS has been in lengthy meetings with organized labor and a coalition of immigrant groups. It appears that after some initial hiccups—labor didn’t think a general strike was feasible—compromise wording will allow for a day that combines militant Occupy actions with a mass march in the late afternoon, beginning at Union Square and heading to Wall Street. And the ILWU fight, despite all the controversy it stirred, may have also highlighted a new strategy that could, if replicated, have wide repercussions: militant community action. Too often, community support for labor comes in a predictable package. Religious leaders hold a prayer vigil, students deliver a petition, postcards are signed. These can work, of course, but nothing of the sort would have brought a company like EGT to the table. And those actions, at least in my experience, are usually directed in a top-down fashion by unions, as escalation plans that fit into a pre-designed campaign package. That being said, the prospect of truly independent action that disrupts business as usual can be a double-edged sword. Unions would potentially be shielded from liability, but they wouldn’t be able to control the animal, and this could lead to further divisions of the sort that were created in Oakland. If there’s an easy answer, no one I talked with has come up with it. Perhaps the most that can be said is that labor needs Occupy, and Occupy needs labor. And maybe an “uneasy marriage” is precisely what both need.